Published by Cyril Huze July 9th, 2017	in Customs, Editorial and Wheels. Spoke wheels have never been, will never go out of style. They are even extremely popular, right now. 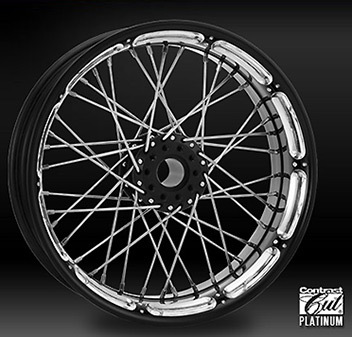 So Performance Machine went beyond fancy forged wheel designs and created new Spoked Wire Wheels mixing the classic style of spokes with modern CNC machining on rims. The Merc Wire Wheel (top) serves nostalgia two ways. 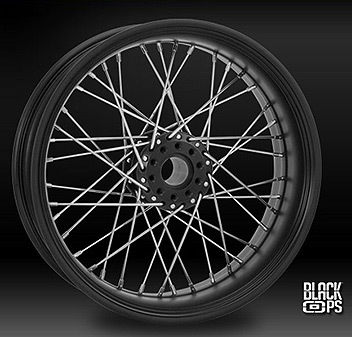 The ribbed concentric lines machined around the diameter of the smooth rim lip are paired with a set of classic spokes that are reminiscent of the Hot Rod era. Subtle and stylish, the Merc is timeless. Finishes in chrome, contrast cut platinum, black ops. Matching discs and belt pulleys and chain sprockets. The Spoked Wire wheel (bottom) is a perfect blend of classic spoke styling and modern CNC-machined rim detail. The aluminum hoop, integrated hub and stainless steel spokes keep these wheels lightweight, yet strong. Finishes in chrome, contrast cut platinum, black ops. Matching discs and belt pulleys and chain sprockets. At Performance Machine. Sweet! Tho I had to go to the PM website to really appreciate the detail of both these wheels by looking at enlarged images. Worth a look! If cleaning just we be easier ! how much to have your own run powder coated and sent to buchanans? or even laced to an excel rim? Tsharp. Not true. Competitor? And spoke wheels are more desirable now, especially in a new rim package. They are definitely 3-4 years old and they are a tubeless design. I have used a set a couple years ago.